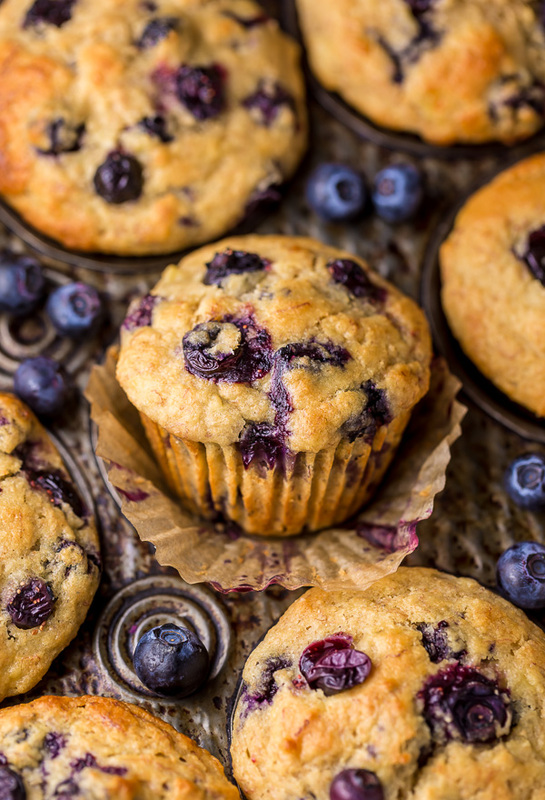 Healthy Greek Yogurt and Honey Blueberry Muffins are moist, fluffy, and subtly sweet! 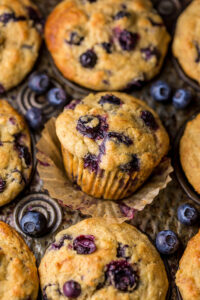 We love this healthy blueberry muffin recipe for breakfast or as a snack! The protein packed Greek yogurt makes these muffins moist and the honey makes them delightfully sweet. 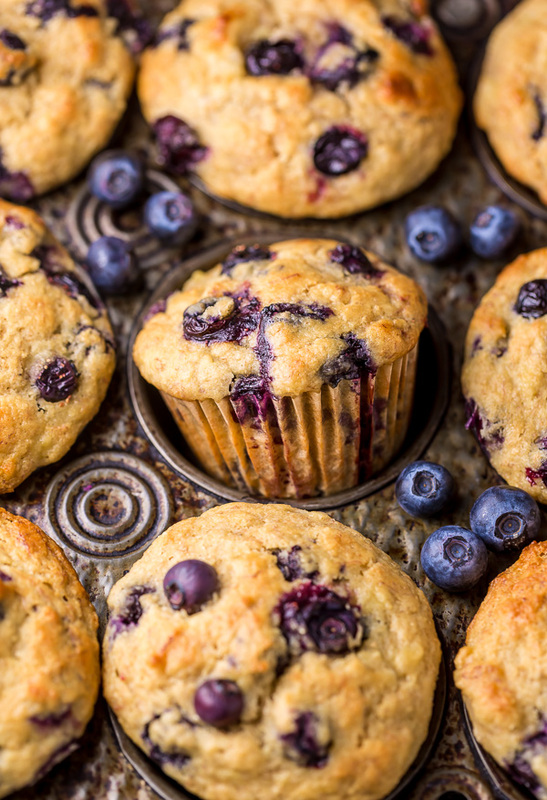 Fact: I’ve always been a sucker for soft, buttery, SUPER fluffy blueberry muffins! Emphasis on the buttery part, for sure. A muffin without butter just seems wrong. And boring. And doomed. And yet… here I am, shouting from the rooftops that I’ve got a new favorite muffin in town, and the batter is made without a drop of butter. That’s right: none. Nadda. Not even an ounce! Whoa. Talk about a game changer! The best part? They’re just as flavorful, soft, and glorious to bite into as their buttery counterparts… minus the guilt! I’ll be saving my butter for brownies from now on, thank you very much! Another unique thing about this recipe: there’s a whole 1/4 cup of honey in the mix! 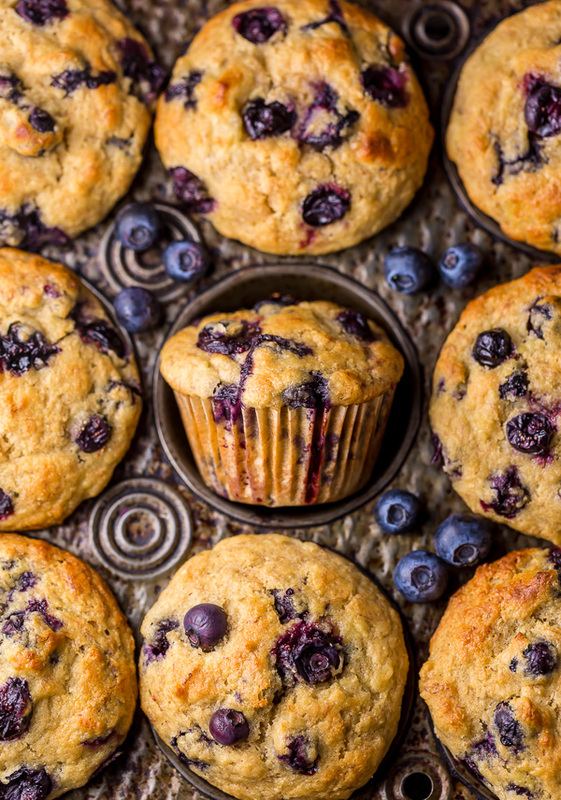 We love honey over here, and I LOVE that you can actually taste the sweet golden honey flavor in every bite of these blueberry muffins. These will definitely be a hit with any honey lovers in your life! Now, since there’s nothing worse than a dry muffin, I added a whole cup of rich, creamy, protein packed Greek yogurt to the batter. This adds intense moisture, and ensures you’ll be left with soft, fluffy muffins. There’s also a splash of milk in the recipe, and you may choose to use anything from whole to skim, depending on your dietary/taste preferences. Earlier I mentioned there is NO butter in this recipe. Let’s talk more about that! Since I cut the butter out, I needed to replace it with another ingredient that would add both moisture and flavor. I also wanted to keep these muffins on the healthier side. I tested the recipe with olive oil, coconut oil, and a combination of both, and am happy to say all three variations are winners! If you choose to use olive oil, I do recommend using a brand that isn’t intensely flavored. 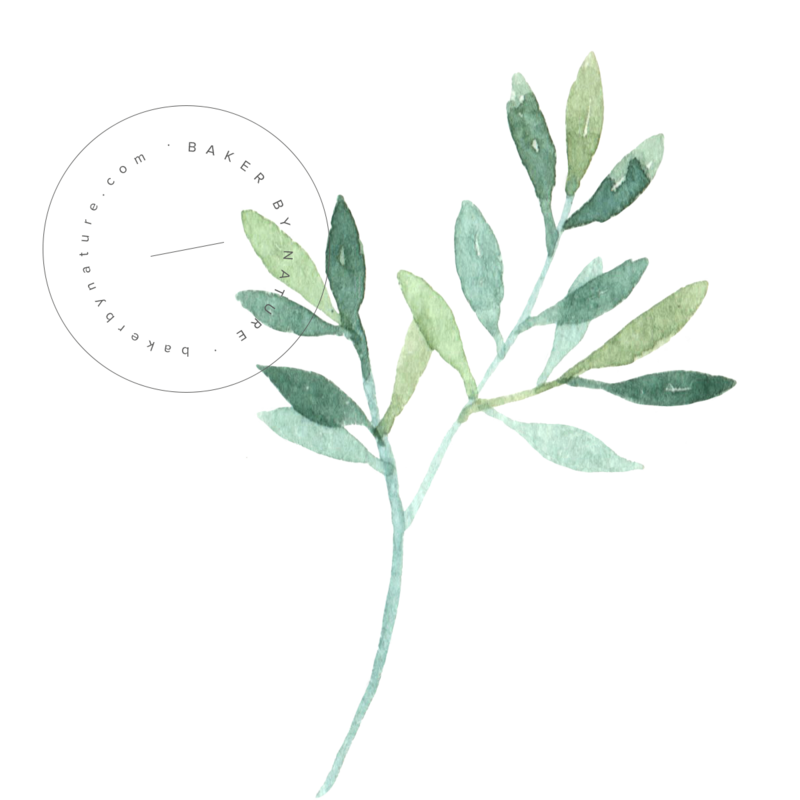 A milder olive oil will work best. Also, the taste of oil in the finished product isn’t strong, so don’t worry about your muffins being overly flavored by either one. These muffins come together super quick, and only take 18 minutes in the oven! They also freeze quite well, so you can also pop half the batch in the freezer if you want to save some for another day. I always find muffins taste best on day one – especially fresh out of the oven – but these will stay fresh for up to 3 days if you store them in an airtight container. Line a 12-cup muffin tin with paper liners; set aside. In a large bowl whisk together flour, sugar, baking powder, salt, and cinnamon; set aside. In a medium bowl whisk together the yogurt, milk, vanilla, eggs, and honey. Gently fold the wet mixture into the flour mixture, and using a spatula, fold until combined, being sure to mix just until all the flour disappears. Fold in the oil. And then fold blueberries. Be sure not to over mix here. Divide the batter evenly among the prepared muffin tin, place pan in the oven, and bake for 16 to 18 minutes. Allow the muffins to cool for 5 minutes in the pan before carefully transferring to a cooling rack to cool completely. Really impressive how these came out without butter. Next time I may increase the sugar or honey a bit since they could’ve been slightly sweeter. But I love them still! I broke down the macros for those interested. Keep in mind I used nonfat yogurt and 2% milk and olive oil. Thank you…was my next question!! I also subbed a half cup oat flour/half cup apt flour instead of using all AP flour and subbed in brown sugar splenda and added Stevie in for more sweetness. They’re in the oven baking as I txt you. I used a solid 3 Cups unbleached white flour as I am allergic to whole wheat. Also I’m lactose intolerant, so instead of milk, I used butter…one can never have enough butter, right? And for the oil, I used coconut oil. The smell coming from my oven right now is overwhelmingly breathtaking! I am also roasting a pork roast in the top oven, as my muffins are baking in the lower oven. I’ll let you know how they turn out! IF the taste is anything near the smell, they will be divine! Thanks for sharibg this awesome recipe! Hi i made these muffins today fire my 8 month old baby and my hubby. I substituted the honey with maple syrup! They both loved loved it. I just wanted to ask. ..i found the taste a little bitterish…coz of whole wheat flour. Can i seamlessly substitute that for spelt flour instead? Also please recommend some other for options to go with it. .I’d like to make a few different batches for her to eat through the month. Thanks so much for this wonderful recipe! ! Hi Shweta. I have never made this recipe using spelt, so I am unable to say if it would work or not. You could easily swap out the blueberries for a cup of diced apples, raspberries, or blackberries. Also chocolate chips would work. These are delicious!! I decreased the brown sugar to 1/3 c, the honey to 2T, the oil to 1/4c. I only had 1/2 c of yogurt so I finished the cup with applesauce. I added 1T of flaxseed and 1 tsp. of raw wheat germ. I increased the blueberries to about 1 1/2 cups or so.Cooked about 16 mins. Yielded 17 muffins. I sprinkled the tops with sugar prior to baking. I’m sorry, but these muffins turned out nothing like the picture and were terrible. I followed the recipe to a T. They are super dense and taste floury and gross. Very disappointed I wasted all of these ingredients. This had happened to me too….it was b/c I over mixed the wet and dry mixture. Over mixing will result in dense muffins. Try slowly folding the mixture together until it’s just blended, then separate into your muffin tin to bake! Hi Ari. The batter is very thick. These look delicious. I know what my Friday morning is going to look like. These look amazing! Do you know by chance,the calorie count per muffin? These muffins sound awesome! I love how fluffy and soft they look and, even better, that they’re filled with such deliciousness as honey and yoghurt. Pretty much my perfect breakfast! These are beautiful girlfriend! I LOVE blueberry muffins too…and NO BUTTAH? They look amazing Ashley. I love sneaking in Greek yogurt and saving some calories. This is an AWESOME healthy recipe! I can tell by the ingredients! Pinning this to try it!! Honey is one of my favorite ingredients to cook and bake with, I love that there is such a generous amount used!! MUST try these girlfriend! These are going to be breakfast tomorrow! Oooh lovely! This is the perfect snack to take to work, I will definitely need to try it! Your pics are gorgeous! My word! These are the most beautiful blueberry muffins!! I bet they taste amazing, too!! I would love to wake up with some of these on my table!! I’m on a breakfast kick lately and could use some new muffin stand-bys! I see this being made time and time again. Love that it’s a bit healthier than your average muffin. I can’t believe that these muffins don’t have any butter or processed sugar in them! they sound absolutely incredible and I love your photos. Actually brown sugar is still a processed sugar… but in moderation for most people it’s ok. People with a sugar sensitivity should probably steer clear. Still Waaaayyyy less unhealthy than your run of the mill blueberry muffins. I love fluffy muffins, oh how I want these beauties for breakfast tomorrow! 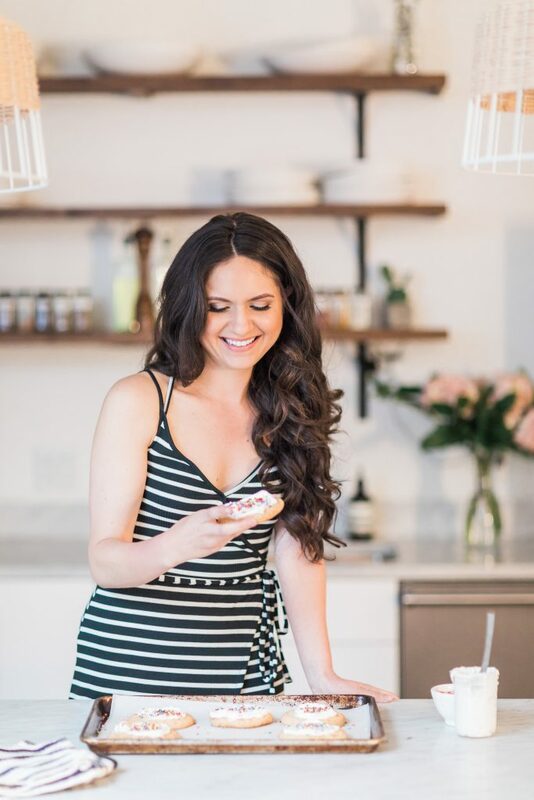 I love baking with Greek yogurt! 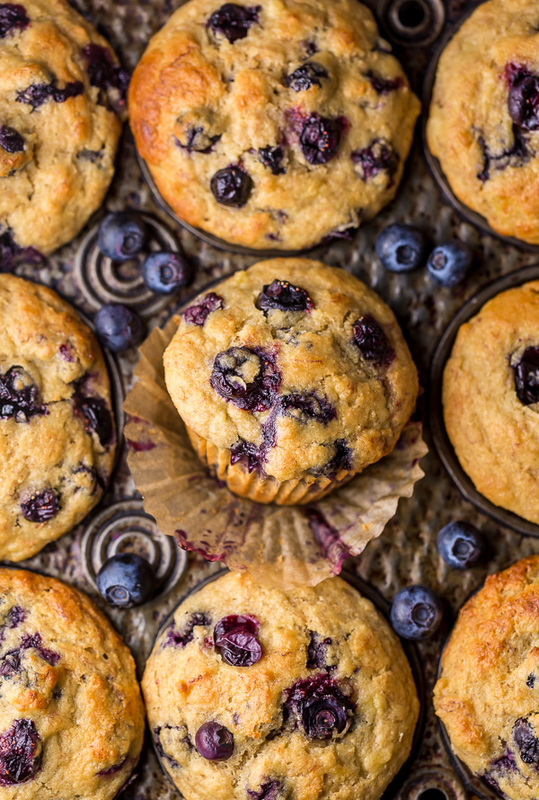 These blueberry muffins look not only healthy but mouthwatering, too! Your photos are gorgeous! These were yummy but I’m wondering if it was supposed to make 24?? My muffins were HUGE and took almost twice as long to bake! Love the recipe though! This also made WAY too much for 12 muffins for me. I couldn’t fit all the batter in the pan. Also I’m wondering about the coconut oil. Your post says to make sure it’s at room temperature. So, at room temperature, coconut oil is in a solid form. This made it extremely difficult to mix. I’m thinking it should have been warmed up a little to become a liquid before mixing? Hi Liz. Yes, you are correct. The coconut oil should be above room temperature and melted. I have adjusted the recipe to note this. Thank you for your feedback. I just found this recipe on Pinterest. I am new to cooking with coconut oil. The coconut oil I have is solid at room temperature. I was wondering if there are supposed to be small chunks of the coconut oil in the batter. Like one of the posters earlier, I am getting 24 muffins in my batch. Yeah! Quick breakfast on the go this week. Are you sure you used an entire tablespoon of baking powder? I made these tonight and they were just ok – not very flavorful. But I did swap out unsweetened applesauce for the oil to make it healthier. Hi Kristin. Yes, I’m sure I used one tablespoon of baking powder. Muffin recipes typically use a higher amount of baking powder so they rise and get that famous muffin top. Swapping out applesauce for oil would definitely change the taste and texture to your muffins. Hi Eva! So good to hear from you 🙂 And thank you so much for sharing this sweet story with me! It’s such a great feeling to know my recipe was a hit with your family. Happy New Year! I just made these. It was difficult batter…more like a dough… But the outcome was worth it…they are really REALLY good. My picky kid eats them so that’s success in itself. They were also huge for me but delicious! My first time using coconut oil. Next time I’ll try that microwaving it for few sec. Took me awhile 2 get it mashed down to just little pieces….oops. They were still Great; thanks. is there anything i could sub for the oil!? Would apple sauce work? Thanks!! Hi Abbie. I’ve never made them with just applesauce, but a reader did and said they came out pretty dry 🙁 I definitely recommend using oil… or butter. It’s 10:30pm and I just finished making and snacking on these gems (hey, I’m pregnant. I’m allowed to make muffins at bedtime! 😛 ). They are seriously delicious. I did add probably 1/3 cup extra of milk (didn’t measure) because the batter seemed way too thick but they turned out beautifully! I am so excited. I ate two this evening and fully intend to have them for breakfast in the morning and will be freezing the rest for our future enjoyment. I also ended up with more than 12 so maybe my muffin tins are smaller but I don’t mind! By any chance do u know the calorie count per muffin? caloriecount.com said the calories are 276 with the olive oil , 10 grams of fat, 17 gram of sugar, 1 gram fiber and 7 grams protein. They do look yummy, but I wouldn’t call them healthy muffins. Even subbing out the whole milk for skim and using non-fat greek yogurt for low-fat they are still 265 calories, 10 grams of fat and 17 grams of sugar. Caloriecount.com gave this recipe a nutrition grade of C-. They might be healthier than bakery muffins, but they are still not healthy muffins. Even though they probably are delicious. Delicious muffins! I used coconut oil and the consistency of the batter was more cookie dough like then liquid. I think it has to do with the room temperature coconut oil. Coconut oil is liquid at temperatures of 75 or above, so unless your room is quite warm your oil is going to be solid. I think if I had melted it then the consistency would have been much more muffin like. It didn’t effect the taste so no problem there. It just might be worth clarifying in the recipe that you mean liquid coconut oil. Since the consistency was so thick I just piled it in the 12 muffin tins so I have 12 HUGE muffins vs. 24 standard size. Hoping the kiddos like them as much as I do! Hi! I can’t wait to make these this weekend. What flavor ,if any, of Greek yogurt did you use and have you ever tried unsweetened vanilla almond milk, which is healthier than skim milk? Hi Kim. I used plain greek yogurt, but vanilla would work OK too 😉 I have not tried it with almond milk, but have a feeling it would work ok. Happy baking! I made these muffins and they are very good for no sugar or butter. They are definitely not a sweet muffin though. I did add the little butter when I ate them. I followed the recipe and used olive oil. I substituted mullberries from my back yard instead of blue berries but they would have been a little sweeter with blueberries. I also made a batch with chocolate chips instead of berries. It made 24 muffins for me. I cooked for 9 min at 400 and only 7 min at 375. These look delicious! I want to try them but am out of blueberries at the moment, would this recipe work with bananas? If so, I wonder how many? Thanks!!! Your pics looked so amazing I had to try them! I have a batch in the oven with 4 minutes to go. The batter seemed thick and I was worried I missed an ingredient but double checking, everything was added. I made a double batch, would that be the reason it’s thick? I’m making one batch now to see how they come out but was thinking about adding more waterm yogurt or milk to it to thin it some. What do you think? Would that mess it up? Oh my word!! These are delicious!!! I’m wondering why you included 1/2 cup + 3tbsp of sugar when you already have honey. Honey is a healthier alternative so wouldn’t it make more sense to increase the amt of honey and omit the sugar altogether? The “healthy” description caught my interest but I saw the amt of sugar which seems a contradiction. I read your readers’ comments and they raved about how great the muffins were without the use of sugar. I’m confused. Please clarify. Hi Celine. Per muffin the sugar intake is much less than traditional recipes. Using all honey causes the muffins to be spongy (too much liquid). Some readers have experimented with reducing the sugar with good results. Thank you for your reply. I will try with less sugar. I reduced the sugar to 1/2 cup and used white whole wheat flour instead of whole wheat. I also substituted raspberries for the blueberries. My son proclaimed that these were the best muffins and his favorite! They were incredibly moist, light, and importantly not too sweet. Right out of the oven, he and I gobbled two muffins each. Thank you for a great recipe. Hi Celine. That is so awesome to hear 🙂 And thank you for letting us know the changes you made! I love the sound of adding in raspberries – yummy. Looking to make these for my kids, but would love the baby to be able to have some. Has anyone tried without the honey? Would I need to sub it with something else? He isn’t one yet, so no honey for him! Hi Kristen. You can sub in maple syrup 🙂 Enjoy! I’ve just made some muffins based on your recipe…But they look nothing like yours! They are very dry!!! Hi Grace, Did you follow the recipe exactly? Or did you adapt? Hi Dominique. You may want to check your oven as this is not normal. I bake with coconut oil all the time and it never causes smoking in my oven. These are so good! I just made them with my kiddos and they turned out great! This is definitely a keeper recipe. They made 15 muffins (I was scared to pile that much batter in the muffin cups), but next time I will pack it all in to 12. Thanks for a great recipe! These are absolutely delicious. I just made them and I added in a little lemon zest and lemon juice. They are so flavorful and my 4 year old loves them! Yum!!! I added a couple tbs of OJ and sprinkled some flax meal. I left the 3 tbs of brown sugar and sprinkled it on top instead. I just vegetable oil because that is what I had. These are so good and easy! I made 23 with my recipe. Thank you so much these are exactly what I was looking for. These are hands down the best blueberry muffins I have ever made. Ever. I love that they’re not super sweet, just very flavorful. And they’re so light and fluffy! Thank you so much for sharing – I’ll be making another batch this weekend! Yay! So happy to read this Bonnie 🙂 Have a great weekend! can I sub canola or veg oil for the olive oil? Hi Stephanie. Yes, that should work just fine. Thanks for the delicious recipe! I added a pinch of cardamom powder and used hemp seed oil instead of coconut oil. Gave it a little hint of nutty flavor. Also added in some raspberries since I had some on hand. The only mistake I made was making them mini muffins. Way too much berry goodness for a small muffin. Next time I’ll go big! Hi Sara. I’m so happy you made and enjoyed this recipe 🙂 LOVE the idea of adding raspberries into the mix! I made these 100% to the recipe and they’re amazing; light, fluffy and very moreish! I’ve seen 265 calories quoted above and compared to your standard Starbucks (other coffee shops are available) blueberry muffin at 448, these definitely qualify as healthier. Also, because there’s less sugar than traditional muffins, the blueberries are the stars and because of the relatively short cooking time, they’re not cooked to mush. I’ve made a batch this morning for friends coming round… They’d better hurry up or there’ll be none left. Thank you so much for sharing this recipe. These are amazing! At first the batter seemed like too much because it filled the cups a little past the top, but they came out big and delicious. This is definitely my new favorite muffin recipe! I tweaked just a few things: baked for 4 minutes extra (which could just be a difference in oven temp), used vanilla Greek yogurt because that’s what I had on hand, and added a large handful of sliced almonds for some extra crunch. Thank you so much for the recipe! Everyone loves them, including my two year old. I know I will be using this recipe many, many times. Hi Barbara. I am so happy to hear you and your family enjoyed these muffins. And I love the almond addition you made – sounds so yummy! OMG!! !these muffins were so amazing that I had to leave a comment. My boys who hate anything healthy tore them up! I did increase the brown sugar and honey. I added oats and flaxseed mill. So delicious and moist. I will definitely be making these again. Also, gotta take a batch into the office to show off. Thanks so much! Tinea, Thank you so much for taking the time to leave this sweet comment 🙂 I’m so happy you and your boys enjoyed them! Why did my batter turn out so dry? They are still in the oven but they look nothing like yours do! I wonder what i did wrong. Great base and robust recipe. Love hearing the adaptions especially the lower sugar one. I made mine with too much yogurt and no baking soda whoops. And still came out great. I’m going to try next to make with half the oil content subbed with avocado. My little one really liked the muffins even though she refuses to have fresh blue berries but my older wasn’t too keen I think because she s partial to chocolate and also doesn’t like fresh blue berries. I was wondering if maybe I can make this recipe with blue berry purée instead Would that make the mix too watery. If yes should I up the flour content. I think my older one would love purple muffins. I made these yesterday and they came out fantastic! I used coconut Greek yogurt and skim milk. Even my 7 year old daughter liked them and she is super picky. Thank you for this recipe! I made these today using a gluten free flour mix (Bob’s Red Mill), and the swap worked very well. I think I have a new favorite blueberry muffin! just found this recipe…..these muffins are fantastic! This has to be the best blueberry muffin recipe I have made ever! I used whole wheat pastry flour and the texture was perfect. Thank you for sharing this recipe! Hello, I made this recipe and it was DELICIOUS. I really liked, I featured on my blog. It’s turkish but I put a link. I made these muffins following the recipe exactly. My muffins don’t look anything like the muffins in the picture. My muffins are a different colour & much bigger (twelve muffins). My batter was extremely dry but didn’t want to add anything else as first time I try a recipe I stick to the recipe 100%. Two things I am wondering: 1) Did you use white whole wheat flour? ; 2) I used coconut oil but had to melt it as had been in the fridge, would the liquid state change the measurement of the oil? It seems a lot of people had success with this recipe. I am baffled. Have been baking for years. Hi Heather. I’m sorry you were not pleased with the way your muffins turned out. I used melted coconut oil as well, and regular whole wheat flour. – used more blueberries! Tossed frozen berries in a little flour before folding in – this helps with the purple muffin effect! I will be making these again SOON! If the Batter is any indication, think these will be Delicious! Thank you! and what exactly makes them ‘healthy’? OMG!! These turned out amazing! I used slightly more than a cup of frozen blueberries (bc mine were so large), and baked them at 400 for 9 minutes, then at 375 for 12 minutes. My batch made 17 muffins, and fulling the cups to the top. The batter is indeed very thick, but they came out fantastic! So happy with the result! After a few unsuccessful attempts, this recipe worked perfectly! I just made a few variations: added 1 more egg because I thought the batter was to thick and a little bit more than 1 cup of blueberries. The only objections is that are a little bit to oily, so next time I’ll put less than a 1/2 cup of coconut oil. I also bake them at 400 during 9 minutes and at 375 during 11 minutes. Hi, I followed your recipe to a T using coconut oil. My batter was very gummy (did I do something wrong?) & there was enough to fill 18 cups to the top, they’re huge. Like others have said mine do not look anything like yours. =/ But they do taste good so I guess that’s all that matters. My fiancé really enjoys them so these will be in regular rotation in my household, I just wish mine looked as pretty as yours. Thanks for the recipe. Oh my lanta. I was a bit skeptical at first. I didn’t quite believe the “bursting bluberries” or the “incredibly moist” comments. These are absolutely perfect!!!!!! Thank you! I just made theses muffins…. My coconut oil was at room temp but when I added it into the yogurt and milk it curdled up do to the coldness of the milk and yogurt, is there a trick to making this not happen? Hi Jodi. In baking it’s always best to have your ingredients around the same temperature. Next time I would recommend letting your yogurt and milk sit out for 20-30 minutes, just so they can come to room temperature. Hi Tammy. Yes, frozen blueberries will work fine – just make sure you don’t thaw them first. WOW, I tell you I had no idea muffins could taste this good without butter or tons of sugar. These are amazing. I followed the steps exactly, except I only had vanilla greek yogurt on hand and used white sugar in the dough on accident. I then read the reviews and sprinkled some brown sugar on top and ate TWO right out of the oven with butter. Amazing! Thanks for this recipe. I doubt I’ll have any to freeze, haha! I did make more than I thought. I got 12 big muffins and 12 mini muffins for my 1 year old son! These were so good. I messed up and bought original strawberry banana yogurt. Went with it and they turned out amazing. I made some with blueberries and then made another batch with raspberries. Even my kids loved them. So so good. Thanks for the recipe. When I have my goats in milk again after kidding in March, I will have my own milk and yogurt to put in the recipe. Thanks for making my breakfast menu list complete. Could I use frozen blueberries with this recipe? Hi Amy. Yes, just be sure not to thaw them. These Blueberry Muffins are fantastic! I used half the amount of coconut oil and substituted unsweetened apple sauce for the other half. Since the apple sauce has some sweetness I only used a little less than half a cup of brown sugar. I also used 2% milk since that’s what I had. This recipe made 48 mini muffins. Baked at 400 degrees for 7 minutes and then 375 degrees for 5 minutes. I didn’t use cupcake liners, just sprayed the pan with Pam. Thank you for sharing this recipe! They were the perfect amount of sweet, moist, and I didn’t feel guilty for eating 3 of them straight out of the oven! These are now, without a doubt, going to be my go to muffin mix! We have multiple allergies, including gluten, so I adapted using 1 1/2 cups oat flour (a dense flour, but very conducive to muffins), 3/4 c sweet and 3/4 c brown rice flours and 1 1/2 tsp xanthan gum. I also used brown cane sugar. They came out fantastic! I’ve already had 2, almost burnt my tongue because I couldn’t wait to try them!! The base mix seems to be hardy enough to stand up to any add ins…I may try some shredded sweet potatoe, cranberry ginger and lemon poppy or chia seed. Thank you for this! Yay! So happy to hear it, Diane 🙂 Happy baking. Made these a few days ago and definitely will be making them again. They were so moist and delicious and people wouldn’t believe they were made with healthy ingredients. Has anyone tried making with all whole wheat flour? My mixture was also super thick so I too added a little extra milk. Not sure why that happened. So amazing. Thanks for sharing! SO happy you enjoyed these muffins, Katrina! I would love to try a different variation of this. At the moment all I have is carrots. I wonder if thuse would work with this recipe? Perhaps wouldn’t be as sweet, but I wonder if the texture would still be good. Any thoughts? Hi Katrina. Honestly I have no idea how the carrots would affect the batter. They would certainly adds moisture and texture to the muffins. Made two batches of these today. I substituted lemon zest for the cinnamon and lemon extract for the vanilla. Then I upped the berries to 3 cups. They were fabulous! Thanks for the great recipe. SO happy to hear it, Adrienne! And I love the idea of adding lemon zest and lemon extract – yum!!! Just made these last night and they were delicious! I was a little worried that they would be too dense, because mind puffed up a lot more than those in the picture, but they were perfect! I added a few more blue berries, and just a bit more brown sugar to help cut the bitterness, since I had read that in a comment. I got a burst of blueberry in the first bite, and it was fantastic! I wasted good bluberries,on this reciepe. The coconut oil is overpowering. Wont try it again. Hi Mary. You can always use canola or olive oil in this recipe. I’m sorry to hear you did not enjoy your muffins. I just made a batch of mini muffins (reduced cooking time to 10 minutes – reduced heat after 6 monutes) and a batch of full size muffins and both are perfect. Baked in a fan force oven according to recommended temps. Thanks from Seacliff South Australia. I made these this morning and the batter was more of a dough. I followed the recipe to a T. Did I miss something or is it more of a dough? They aren’t done baking yet so we shall see. I just made these for snack for my son’s class tomorrow. So delicious! Mine made 15 muffins. I just inhaled one. I did sprinkle just a tiny bit of sugar in the raw on each one. Thinking of trying this with strawberries. So good! I substituted with vanilla soy milk and vanilla coconut “yogurt” because of my daughters Dairy allergy and the muffins turned out great. My children and spouse loved them. Thanks for sharing this recipe. I bought all of the ingredients today. Or so I thought. Accidentally grabbed regular yogurt. Do you think that will be an issue? Ok thank you! I will keep you posted. Fingers crossed it works, I cannot wait to try these. Made these this morning for my 9 month old’s breakfast – I omitted honey and increased brown sugar by 1tbsp and a dash of milk extra – also used frozen blueberries. They turned out great! So soft and buttery without the butter! I love the sweetness – just right for a baby who doesn’t need much and a mom who doesn’t need much;) We’ll be making these again! These were great! I didn’t have whole wheat flours, so I used unbleached all purpose flour instead. They still turned out great! I did end up putting a sugar crumble on the top of my second batch because I was craving some extra sweetness ;). I’m not a baker, so I was worried I was going to over mix, so I took my time haha. I love that this recipe has less sugar than most recipes! I LOVE how moist hey stay! Yum yum yum! I subbed 3/4 cups of wheat flour for oats and only did less than half cup brown sugar. The rest I compensated for honey. They came out so good. I filled my tin cups pretty full and still got 12 regular muffins and then thenrest i did in mini. I got about 18 of those. I put in the normal muffins wihtbhe time noted and pit in the mini muffin tray about 6 or 7 minutes later in the lower rack/underneath the regular ones. They came out perfectly golden brown. I migt do more subbing next time. More oats and more honey. I did use coconut oil too. So so good. Thank you! These are delicious! And very easy to make. I made them with half almond flour and they turned out great. hi, do the blueberries have to be fresh? or can i substitute with canned ones or dried ? Hi I am really excited to make this recipe! I followsed it exactly and the mixture after I put together the liquids and the flours was quite think! Is that ok? I thought the batter was quite thick and I also checked the recipe twice to see if I missed some liquid. Not sure why some are raving about how good these are and I found them boring and flour-y. I know my family will still eat them anyway. Not a keeper for me. I didn’t have enough blueberries so used 1/3 cup each of blueberries, blackberries, and raspberries. I also used unsweetened almond milk and was able to make 19 muffins at 171 calories per muffin. Thanks again for creating this recipe!! I can’t say enough about how much my family and I enjoyed them!! These are the best “healthy” muffins I’ve made yet! Absolutely worth making. Don’t even need butter or honey on them when they come out, as they’re flavorful enough with great texture! Mine are in the oven now! I used frozen blueberries, almond milk, coconut Greek yogurt and vegetable oil bc it’s what I had, and applesauce instead of eggs. In my standard muffin tin I ended up with 18 FULL muffins. They’re rising nicely and smell great, can’t wait to see how they turned out! Yay! How did they turn out? So delicious! I used two cups of oat flour and 1 cup of all purpose flour. I substituted plain Greek yogurt with lemon Greek yogurt. These will not last long! Love this recipe. I used raspberries and vanilla Greek yogurt. Yes the batter is thick but I made sure to not over mix. I got 21 muffin. My boys ate them up. I’m actually making more but with blueberries this time. Thank you for the recipe! Wow! 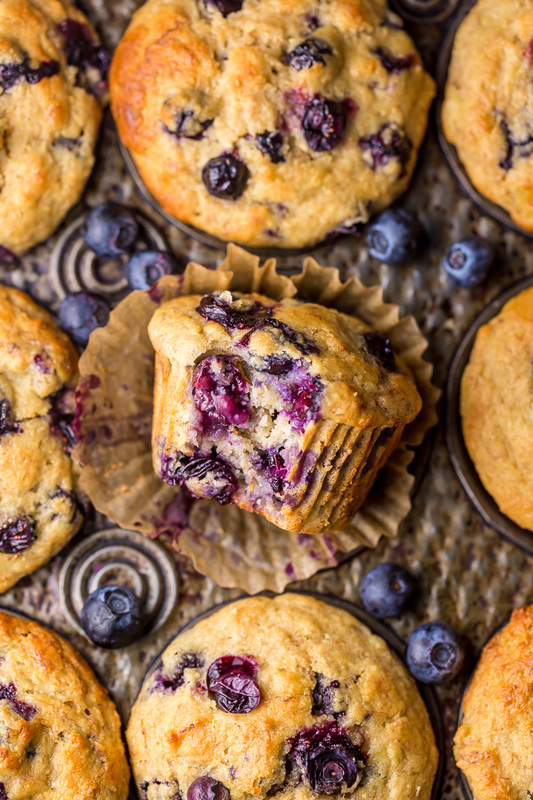 This healthy greek yogurt honey blueberry muffins recipe is incredible! I’m seriously so inspired right now. I need to add 1 tsp.honey to recipe and it would be perfect. Thx for sharing! heart surgery. he loved them; moist, tasty, lots of blueberries. Thanks for the recipe. Good taste and Legal to eat on heart diet! With modifications, this is my go-to blueberry muffin recipe! The first time around, the muffins were a bit too dense. I only use one cup of AP flour and one cup of whole wheat flour (rather than three total cups of flour as the recipe calls for), omitted the honey, and added zest from one small lemon. Otherwise, I follow the rest of the recipe and have made it many times. The muffins are light and fluffy, with just the right amount of sweetness. My whole family (including school age kids) love them! These muffins are amazing!! I did change the recipe a little though. Instead of whole wheat flour and all purpose flour I used Namaste Gluten Free Flour because I have a very bad reaction to gluten. Tastes like a muffin with normal flour! These are now my favourite muffins. Would definitely recommend! Swapped the AP for almond flour and added coconut flakes – turned out great. Thanks for the recipe!!! It’s one of our regulars. This greek yogurt honey blueberry muffins recipe so extravagant and look yummy:) I’m afraid I will not find the ingredients for this recipe! I messed up this recipe in so many ways (forgot the oil until after I had mixed in the blueberries, but added it and tried to mix it in, and completely forgot to add the brown sugar!!! They were slightly dense due to my over mixing (and the paper liners are a bit extra greasy), but my ultra picky daughter declared these delicious! (I’m hoping that she’ll still like it when I make it correctly in the future.) I made 36 mini muffins plus 4 regular sized muffins. I love these muffins. It’s incredible that this is a low-sugar recipe, which is one of the things I like about it. I tried out the recipe just as you did, and the results were fantastic. Me and my family loved every bite. These were so good. I used spelt flour and skim milk. Perfectly moist and made 12 perfect sized muffins.